Friday Night Lights "Youth Flag Football", with over 15,000 participants, is THE LARGEST YOUTH FLAG FOOTBALL LEAGUE IN THE UNITED STATES, is very interested in taking this FUN and EXCITING brand of Football to more cities across the United States. 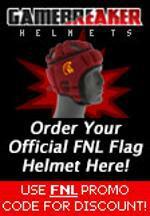 If you are interested in being the General Manager/Commissioner for your city and running an FNL League of your own, please send an email to FNLFootball@aol.com or call 562-756-5307. Please be sure to identify your full name, phone # and where you would like to develop your own FNL League. We will get back to you quickly! There are a lot of "Keys To Success" in making this work in your community and not have it be just another youth sports league. The proven FNL method will help you create THE MOST EXCITING YOUTH SPORT IN YOUR AREA! ©2019 Friday Night Lights-Garden Grove / SportsEngine. All Rights Reserved.